Carolrhoda Books, Minneapolis, 2015. 36 pages. This picture book biography tells the same story the same creators told in the novel No Crystal Stair, but I found myself warming more to the picture book. 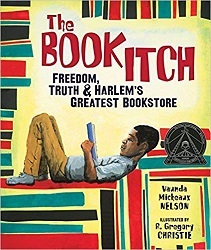 Mind you, it was nice to have all the background from the novel (which was very close to being nonfiction) about the life of the author’s great-uncle, Lewis Michaux, who owned the National Memorial African Bookstore in Harlem. The picture book is told from the perspective of Lewis’s son with the same name. It communicates the spirit of the man, his pithy wisdom, and the supreme importance he placed on books and on black people knowing their history. This picture book starts later than No Crystal Stair did, not telling about Lewis Michaux’s entire life, but looking at a time when the bookstore was at its height and his son met people like Muhammed Ali and Malcolm X there. Dad opened his store in Harlem Square way before I was born. Mom says he started out with five books. Five books and a mission. She says he had something in his heart he believed in so much that he’d do just about anything to make it happen. Dad says he got the book itch and needed to scratch it. This entry was posted on Saturday, November 10th, 2018 at 10:57 pm and is filed under Award Winners, Biography, Children's Nonfiction Review, Starred Review. You can follow any responses to this entry through the RSS 2.0 feed. You can leave a response, or trackback from your own site.